Virginia N Nicholas, 75, of Mansfield, PA, died Tuesday, August 20, 2013 at the Green Home, Wellsboro, PA.
Born: Virginia was born August 16, 1938 in Easton, PA, a daughter of the late William and Elimina (Cole) Newman. Personal: She worked as a secretary for Henry S. Lehr Insurance Co. in Easton, PA before she retired. 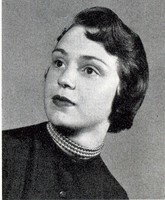 Virginia was the wife of Lamont H. “Monty” Nicholas. Membership: She was a member of St. Joseph Catholic Church in Easton, PA until1961. In 1962 she became a member of St. Lawrence Catholic Church in Rigelsville, PA where she sang in the choir. She was a member at Holy Child Catholic Church, Mansfield, PA. Survivors: Virginia is survived by her husband, Lamont of Mansfield, PA; a son Michael L. Nicholas of Scranton, PA; a daughter and son-in-law, Joanne N. and jonathan Shaw of Mansfield, PA; three geandcgildren, J.P., Cooper and Elaina.